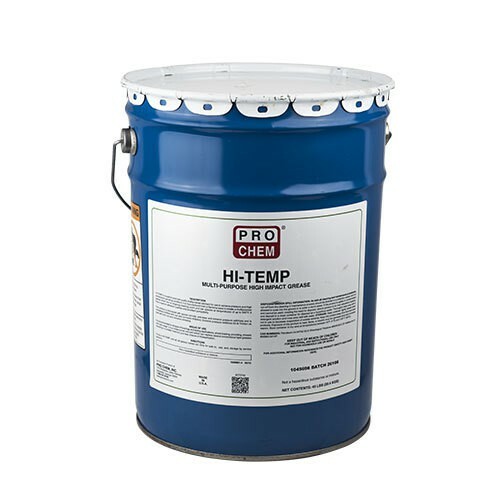 HI-TEMP | Pro Chem, Inc.
HI-TEMP is a multipurpose grease that is fortified with special additives, enabling it to withstand the heavy impact and pounding pressures common to heavy equipment. 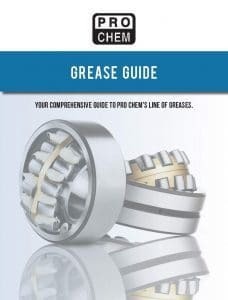 A special additive allows the grease to stay in place and not to spatter or pound out of the bearing or fitting. This formulation includes characteristics such as special lubricants, anti-wear additives, the ability to withstand extreme pressure as well as superior water resistance. This enables HI-TEMP to resist most acids, salt spray, steam, dirt, dust and weather. This product is appropriate for use as a lubricant with no food contact in official establishments operating under the Federal meat, poultry, shell egg grading and egg products inspection programs. This compound may be used on equipment where there is no possible contact between edible products and lubricants or lubricated parts. Pump in HI-TEMP until all old grease comes out. Only for sale to, use by and storage by service persons. Product Guarantee: We guarantee all we sell to the complete satisfaction of our customer. In the event a product we sell fails to meet our customer’s requirements, we offer a simple return procedure that is effective up to 30 days after the date of purchase. For full credit on the unused portion, request a Return Authorization Number from our customer service department. No returns will be accepted without an RA number. We cannot issue credit on any goods purchased more than 90 days previously. All returns for reasons other than performance quality must be in original packaging and are subject to a 15% restocking charge plus freight charges. Any claims resulting from damages during shipment must be made no later than 48 hours after the shipment is received.